A New Zealand Design-Tech start-up company Revology has introduced a reinterpretation of the legendary 1850s bistro chair, which is also said to be the first chair to be made out of flax-fibre tubes and biobased materials. It will unveil the design of its Revology concept chair at JEC World, to be held from 8-10 March 2016 in Paris Nord Villepinte. “JEC World is the leading exhibition in the composite sector. 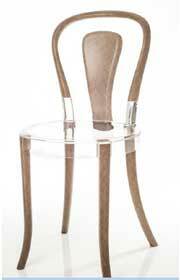 That’s why we decided to unveil our Revology concept chair there in an exclusive preview. It is a perfect illustration of the design freedom that composite materials offer. The result of a real technological feat, the chair will be made using the most innovative of nature-friendly processes and materials. With this object, we are continuing to push the technological envelope to reach for new, green, design-worthy goals,” explains Revology CEO Alex Guichard. The play of contrasts between transparency and the raw natural material makes the Revology concept chair an object that will break the mould of international design. Its organic feature is an essential element in the brand’s DNA. Using composite materials for the chair has the advantage of making it lightweight, versatile and strong, with an elegant design that time will not alter. "Composites are used in the aviation industry and luxury sectors, so they tend to be seen as materials that are too technical or inaccessible. With Revology, we want to show that they are also materials that we can introduce into our everyday world. We want to make them attainable for the general public: sustainable design, high-end product but reasonably priced," concludes Guichard. Revology is a “design-tech” start-up created in 2014 in New Zealand with the aim of relooking the 19th Century bistro chair. Drawing on its signature "Inspired by nature" Revology develops timeless design objects combining exclusive processing technologies with innovative materials. The Company's DNA has its origins in the use of biobased resins and composite materials of natural fibres of flax.